Leonard Brown sis trying to sell this Navajo rug, in his Pueblo home in July. 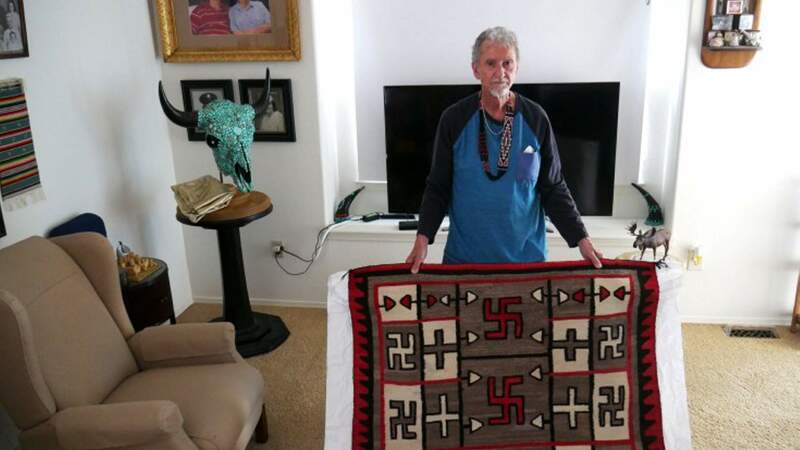 The rug has “whirling logs” on it, a sacred Navajo symbol. DENVER (AP) – The rug had several columns, with bright red squares down the center and a few lining the edges of a neutral-colored background. At first glance, the square-shaped symbols looked like swastikas – a symbol Hitler’s Nazis made synonymous with death in World War II. But, as it turns out, they weren’t swastikas at all. They’re sacred Navajo emblems that predate World War II known as the “whirling log,” “falling log,” or “swirling log.” It looks like a cross with shorter, 90-degree-notches at the end of each line, creating a swirling shape. Brown, who’s nearly 80 years old, is selling the rug for $5,000. His walls now have empty spaces where other rugs, photos and paintings once hung. But Brown said it’s this rug’s design that’s attracted quite a bit of interest. He said he’s had to correct callers who believe the symbols are swastikas. It’s been debated on whether the sacred symbol rotates to the left or right. But Eskeets said that for the Navajo, it goes in both directions. The four sacred mountains – Blanca Peak and Mount Hesperus in Colorado, Mount Taylor in New Mexico, and the San Francisco Peaks in Arizona are also represented in the symbol. “There are plenty – hundreds and hundreds of Navajo textiles with the whirling log in it, but they all ended in the 1930s,” said Alexander Anthony, owner of Adobe Gallery in Santa Fe, which specializes in contemporary and historical Southwestern art. Brown advertised the rug for several weeks and has yet to sell the textile. Anthony said plenty of collectors are aware of the symbol’s history and appreciate Native American art. But, he said, it’s important for any sellers and interested buyers to know the story behind the whirling log – and understand when and why a piece was made.